Central snowdonia location for family get-togethers, birthdays and reunions. 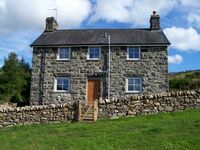 Property 47: Central snowdonia location for family get-togethers, birthdays and reunions. The five of us had a wonderful stay in this beautiful holiday house. It is very spacious and well tended to. The kitchen has absolutely everything a gourmet cook could want with fully accessorized kitchen gadgets. The lounge was perfect with the wood burner, games, comfy sofas, plus it had a door so one could have a gathering there without disturbing the rest of the house. The bedrooms all had very comfortable and warm beds. The bathrooms were really nice, in keeping the quality of the house overall. The village of Dolgellau provided everything we needed, including food, pubs, restaurants and a variety of shopping choices for clothing, pharmacies, books and nicknacks. Set on the flanks of Caider Idris made this the perfect choice for the hill walkers of the group, and we walked and climbed almost everyday. We all all highly recommend Llwyniarth as the perfect choice for a holiday retreat.